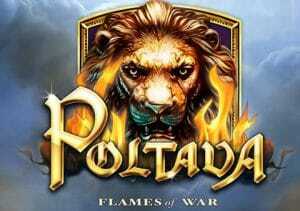 Head back in time to the 18th century and the Great Northern War in Poltava Flames of War. We’ll be honest, we knew little about this battle that pitted the forces of Sweden’s Charles XII against Peter the Great of Russia. What we do know about this 5 reel, 40 payline military themed video slot from ELK Studios is that it comes with free spins, sticky wilds and marching reels which can deliver mighty jackpots of up to 1,800 times your stake. Play from between 20p and £100 per spin. Visually, Poltava Flames of War is very impressively done – the reels are set against a dense, forest backdrop where a battle has recently taken place. Joining the lower value A to 10 symbols are a soldier taking aim with a musket, a cannon and a white horse. 5 of the latter on a payline will get you 200 coins. They’re joined by the Poltava logo which is the wild, substituting all other symbols bar the lion. The lion is the key to unlocking the first of the bonus features we’ll look at – land 3 of them and you’ll activate the Flames of War feature where you’ll be awarded 3 free spins complete with 3 sticky wilds. If any more bonus lions land during this feature, you’ll be given another free spin with another sticky wild added to the reels. An initial allocation of just 3 free spins may seem a little miserly but the sticky wilds and extra free spins can quickly pay dividends. The second main feature on offer in Poltava is the Marching Reels feature – to trigger this, you’ll need to land the soldier, cannon or horse in a fully stacked formation. A re-spin will then follow. Any of the same symbol that triggered the Marching Reels that fall to the right of the stack will get you more re-spins. Troops then march rightwards and in the process create bigger winning combinations with prizes to match. Better still is if a higher value military symbol lands fully stacked (for example, you triggered the feature with the soldier but a full stack of horses land). This new higher value symbol will then replace all of the lower value symbols in the formation, offering even better rewards. The feature continues until you make it all the way to reel 5 or no new symbols are added to your winning military formation. The features on offer in Poltava are certainly a little different from what you’d find in say, a classic fruit machine. Having a few spins in demo mode does no harm until you get your eye in. Once you have become accustomed to the unusual gameplay, there’s much to enjoy here. The design is top notch and the unorthodox extras offer plenty of potential. This is a fairly volatile game with the variance in the medium to high range. Even if you know nothing about the conflict on which this video slot is based, there’s still plenty to get stuck into here. Get lucky with the features and you could march offer with plenty of spoils of war. If you like the look of Poltava Flames of War, I recommend you try ELK Studios’ other hit game, Taco Brothers.